The Royal Enfield Interceptor 650 is available in 3 variants and six colors. 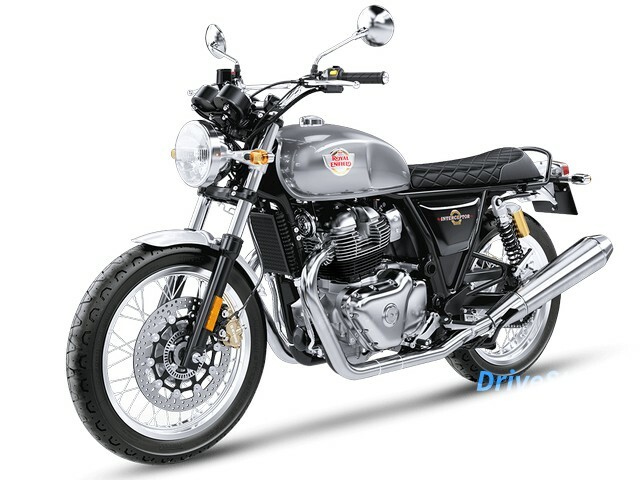 Check out Royal Enfield Interceptor 650 prices, specifications, colours, and mileage. Our detailed Royal Enfield Interceptor 650 comparison helps you compare the bike with its competitors. DriveStreak brings you all the information about Royal Enfield Interceptor 650 to help you make the right buying decision. The Interceptor 650 is inspired by the Royal Enfield Interceptor from the 60s carrying a roadster design. The bike fits into the easy going and fun character of a British roadster, uses the same dual-cradle, tubular steel frame and is a blend of timeless styling and contemporary performance. The bike is designed and developed by Harris Performance. The Royal Enfield Interceptor 650 is powered by a 648cc parallel-twin air-cooled engine mated to a six-speed gearbox. The fuel injected two-cylinder unit produces 47 bhp @ 7250 rpm and 52 Nm @ 5250 rpm. Feature wise the Royal Enfield Interceptor 650 gets a dual pod instrument cluster, dual channel ABS, disc brakes at the front and rear and dual exhausts. The Interceptor 650 is offered in 6 attractive colors namely – Mark Three, Glitter Dust, Orange Crush, Ravishing Red, Silver Spectre and Baker Express.